Recently, news about the new Google TV from LG can be seen everywhere, especially on social media, which makes me think about the strategy of Google and Apple on Internet TV. I find out that under the cover of complex actions, they have pretty simple goal. In the early days, Apple was a computer company. Now, Apple is still doing the same business by making the computers smaller (like iPhone and iPad) or bigger (like iTV). There is no doubt that Apple’s goal is selling hardware, and the perfect Internet performance and user experience are just the ways to make their hardware products more attractive. In the past few years, Apple also made amazing software products to make their hardware products more competitive. Nowadays, the growth of PC market is slow and competition is severe. Plus, compared with other consumer electronics, like cell phone, the life cycle of computer is longer. For example, the usual update cycle of a laptop could be 3-5 years. Hence, Apple turns to consumer electronics products which have a shorter update cycle. From the iPod to the iPhone and then the iPad, all these products were sold fast and updated frequently. Apple TV is another important product that may change the way we watch TV. Hardware market is full of competitions, and price competition does drain the profits. Apple’s strategy is to think different. Perfect user experience is the key to make their products more attractive, and more profitable. The other way is adding more services on their hardware products, like FaceTime, iCloud, Siri and App Store. This is just like a five-star hotel which provides a series of supporting facilities and services like gym, swimming pool, coffee bar and pick up service. But the main business indicator is still the room occupancy rate, which to apple is the number of sold products. Google is an Internet company and has a completely different commercial mode from Apple. Apple sells their services and products directly to each user, while most of Google’s services are free to end users. The way Google makes money is to provide advertisement service for other companies through their large number of users. Both Android and Google TV are designed to serve this purpose. By allowing clients to use their services anywhere, Google will stay ahead in Internet and mobile era. Now let us check the new LG Google TV. It looks like a win-win situation for Google and LG. The problem is: beside LG, Google also cooperates with other companies, like Samsung and Sony, which leads to an embarrassing situation that those manufacturers will compete with each other in the future. How could be harmony in such a camp? On the other hand, Google is certainly going to set up obstacles to stop hardware manufacturers customizing Android too much. The frequently incompatible version upgrade is one of the best proofs. But if the manufacturers cannot customize Android, their products will unavoidable be similar to each other, and it is hard for all the manufacturers to establish their own core value. Same situation may happen on Google TV. This entry was posted in Reviews and tagged Apple TV, Google, Google TV. Bookmark the permalink. One Response to What Google & Apple want from Internet TV? How could be harmony in such a camp? I disagreed on this. Microsoft had been done this with Windows for years, and I don’t see PC makers having problems with Microsoft. 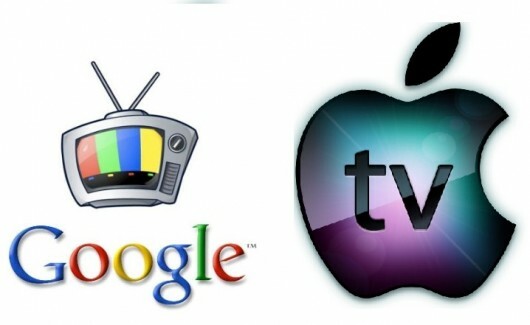 They compete between each other, but not with Microsoft, so I guess the same can apply for Google TV. On this one I think it is a problem, I just hope that Google had learned from Android phone customization/fragmentation experience, to try to have the Google TV platform consolidated. Technically a solution for the manufacturers to distinguish between each others can be as simple as every TV manufacturer create his own customized launcher under the same Android infrastructure/version, but this area need to be planned careful by Google.